Martha Dodd wasn’t particularly happy when her father was appointed U.S. ambassador to Germany in 1933. When the family arrived in Berlin, Martha found the city irresistibly fascinating, and she immersed the tour guide in a steady stream of questions about architecture, history, and culture. The touring car soon arrived at the Reichstag building, which four months earlier had been the scene of an arson attack that precipitated a politically convenient crisis. The terrorist incident, which was supposedly the work of a small knot of saboteurs led by a Dutch Communist named Marinus van der Lubbe, provided the impetus for passage of the “Law for Removing the Distress of People and Reich” – the “Enabling Act” that served as the legal foundation for the national socialist dictatorship. Brandon Raub, a Marine combat veteran, was abducted at his home in Chesterfield, Virginia by a thugscrum of federal officials and local police on August 16. He wasn’t charged with a crime; instead, he was taken into schutzhaft on the pretext that some of his Facebook posts concerning current affairs evinced symptoms of mental derangement or terrorist inclinations. Raub was handcuffed by the police when he displayed “resistance” – in this case, passive non-compliance. Following a perfunctory mental status hearing, Raub was confined to the John Randolph Medical Center, a branch of the American psychiatric gulag – or what the Soviets called the psihuska. I recognize that this description mingles totalitarian idioms, but this is necessary in order to capture the specific flavor of American’s version of the Total State. It doesn’t offer the lurid pageantry of National Socialism, nor does it mimic the same drab, soul-deadening grayness of the Soviet model. America’s “soft” totalitarianism blends some elements borrowed from its Soviet and Nazi predecessors, while adding a generous helping of the State-supervised consumerism depicted by Aldous Huxley. The legend on this federally subsidized vehicle reads "Free speech unit." Raub came to the attention of his overseers after publicly expressing doubts about the official narrative of the 9/11 attacks – the contemporary “Reichstag Fire” incident that led to the USA PATRIOT Act and the Bush administration’s open-ended Authorization for Use of Military Force. Those two measures, taken together, constitute the modern equivalent of Hitler’s “Enabling Act.” Raub demanded the arrest and prosecution of elected and appointed officials responsible for myriad crimes against liberty and decency. Although Raub was seized at gunpoint and dragged from his home in handcuffs, none of those who committed the act will admit to “arresting” him. “The FBI did not arrest him,” insisted Bureau spokesliar Dee Rybiski. Raub “was not arrested by us on any charges,” insisted Secret Service apparatchik Max Milien when asked about the case. “We were assisting the FBI in this matter,” simpered Lt. Rich McCullough of the Chesterfield Police Department. “All we did was transport him” to the psychiatric gulag. Totalitarian states always require acts of immaculate suppression: Millions are seized, imprisoned, and slaughtered, and those atrocities somehow commit themselves without the conscious involvement of individuals. One incident like the abduction of Brandon Raub could be considered an anomaly; two may be a coincidence; three constitute a pattern. Raub is just one of several Americans who have recently been taken into shutzhaft by operatives of the Homeland Security State. Several months ago, Washington, D.C. resident Matthew Corrigan, a depressed veteran seeking help for a sleeping disorder, was arrested by a SWAT team after he mistakenly called the National Suicide Hotline. Despite the fact that he was neither a criminal suspect nor a suicide risk, Corrigan – like Raub -- was hauled away in handcuffs and imprisoned. When Corrigan, an Army Reservist employed by the Bureau of Labor Statistics, placed the phone call on February 2, 2010, he hadn’t slept for several days. He dialed what he thought was the number to the Military Emotional Support Hotline. While speaking with a counselor, Corrigan mentioned that he was a veteran, and answered “yes” when asked if he owned a firearm. He then turned off the phone, took a sleeping pill, and retired for the night. Lt. Robert Glover, the on-scene ERT commander, angrily replied: “I don’t have time to play this constitutional bullsh*t!” and ordered the team to invade the property. Corrigan was taken to a VA hospital, where it was determined that he wasn’t a suicide risk. 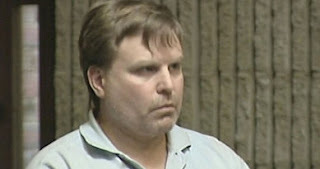 Despite the fact that he hadn’t been charged with a crime, Corrigan was held in jail for roughly two weeks before being released. He was also required to report each week to Pretrial Services. In Corrigan's absence, the SWAT team ransacked his residence. Without either a warrant or probable cause, the police deployed a bomb squad to search for explosives and firearms. They eventually found two handguns and a rifle, all of which were legally owned and properly stored. Corrigan was not the first innocent gun owner to be seized by a SWAT team and detained without criminal charges owing to his suspected psychological instability. On March 8, 2010, David Pyles of Medford, Oregon awoke to find his home surrounded by company-strength contingent of police -- two SWAT teams, officers from two local police departments, sheriff’s deputies from two counties, and troopers from the Oregon State Police. A few days earlier, Pyles had purchased two handguns and an AK-47 rifle. Shortly before he used a tax refund to buy the guns, Pyles had been put on administrative leave by the Oregon Department of Transportation. The negotiator, being a police officer, performed as he was trained to – that is to say, he lied. All of this, according to Sgt. Jeff Proulx of the Oregon State Police, was a successful exercise in “proactive” police work. Girard’s “arsenal” came to the attention of the police when his wife, a psychiatrist, told them that she was afraid to return to their home following an argument.On the following day the police were contacted by the ATF, which relayed a report from someone described as a “friend” of Girard’s wife who supposedly saw hand grenades in the apartment. At the time, Girard held a Class A firearms license and had registered all of his weapons. Glenn McKiel, Chief of the Manchester-by-the-sea Police Department, revoked Girard’s license and called in the Cape Ann Response Team (CART) — the Homeland Security State’s local paramilitary affiliate — for a joint assault on Girard’s home. Among the specific concerns related to the police by Girard’s wife was his supposedly alarming view that martial law is imminent. In terms of his personal experience, Girard’s fears were vindicated in every detail by the behavior of the police who invaded his home. The same spurious classification was used to detain and disarm David Sarti, an honorably discharged Air Force veteran and truck driver from Lebanon, Tennessee. 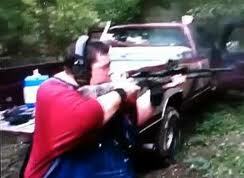 In January of this year, Sarti was declared “mentally incompetent” and had his firearms confiscated by the state government after appearing on the National Geographic Channel’s program “Doomsday Preppers.” This was done on the pretext that Sarti, who had sought treatment following what he thought might have been a heart attack in late 2011, was supposedly a suicide risk. During the examination, the physician brought up the subject of suicide. “I told him I can’t do suicide, because I’m a Christian,” Sarti explains. Told that he had to go to the emergency room, Sarti objected that he had to see to his farm, and went home. Fifteen minutes later, sheriff’s deputies materialized on Sarti’s property and forcibly took him to the emergency room. Following his release, Sarti discovered that medical authorities had “terminated” his right to own firearms and seized his guns. “You have been declared mentally defective by having been committed to a mental institution,” declares the document Sarti received. As was the case with Raub, Corrigan, Pyles, and Girard, Sarti was never accused of a crime. Sarti was not declared mentally unfit by a judge, nor has he ever said that he wanted to end his life. His refusal to take government-approved mind-altering drugs – one of which listed “suicidal thoughts” among its side-effects -- was treated as evidence of his mental instability. What clinched the case against him -- in the eyes of his abductors -- was Sarti’s “socially dangerous” political views: What responsible member of the community would promote the individualist heresy called “survivalism”? The tacit message taught by each of these incidents is a variation on the survival advice given to Martha Dodd: This isn’t America anymore; you can’t say all the things you think. A wonderful Facebook friend has organized a "money bomb" on my behalf. Although any expression of gratitude is inadequate, I want to thank her -- and everybody who has donated -- on behalf of my family. This means more to us than we can adequately express, particularly in light of the fact that many who have given to us are in similar financial straits. God bless you! So where does this Free Speech Unit have it's home? I almost suffered this fate. I have MS, a couple years ago, I was suffering through muscle spasms that kept me in pain for months. I was unable to sleep. I could not concentrate. Nothing the doctors did would help. I was scheduled to go in to the hospital for some out patient tests. My wife had called the doctor that morning and was asking if they could do anything else. She made the statement that "I don't see how he is living as much pain as he is in." I didn't know she had made this call. After the tests, my father had me go to the emergency room (I couldn't drive so he took me for the tests) to see if they would treat the pain. I didn't want to go. I knew they would not do any thing. But after he begged and pleaded, I relented. The ER doctor must have thought I was trying to scam pills. I answered all of his questions, told him what meds I was on and what didn't work. He went away for a bit. I decided I was going to leave. I stood up and started getting dressed. About that time a couple of goons showed up and said the ER doctor had talked to my regular doctor and learned of my wife's statement. He said I was a danger to myself and put me on a 72 hour hold. I hit the roof. It was 2 days before Christmas. I wanted to go home. I started to leave. I had made no statements about harming myself. I had no intentions of harming my self. After a run in with the goons, the local PD was called. I was passively resisting, I laid on the floor and refused to stand. The thugs with badges, then threatened to taze me. Probably not the smartest thing to do to someone with nerve damage and a disease like MS. I finally relented, and went to a hospital bed after I was threatened with a ride to the state mental hospital. I made the female cop leave the room before I would change back into the gown. That pissed them off, but she did it. I also made them count all of my meds and secure the bottles with tape, I told them I didn't trust the hospital goons to not steal them. Later, after the ER doctor had left the mental health specialist showed up. After talking to me for about 10 minutes he cut me loose. I left the hospital with promises of suing every one of the goons, the doctor and the hospital. Funny, but all of the paperwork from that day got lost. They didn't even bill my insurance for the tests I had that morning. If it hadn't been for the one MH specialist who had some small degree of humanity, I imagine I would still be in the state mental hospital. where does this Free Speech Unit have it's home? That'll take some digging. When you do, be sure that you use anonymizing browser software. Not that you'll find anything; the cowards who ride around in armored vehicles and who garb themselves in body armor are quivering castrati when it comes to "showing themselves." People certainly need to work together and help each other out in these trying times. Americans for some reason seem almost deathly (oops! can I say that?) afraid to co-operate, and it is IMHO the key to defeating these psychopaths that pose as legitimate authority figures. There is not only strength in numbers - their is synergy in numbers. Absolutely disgusting abuses of power and in all reality treason. How is the Constitution subservient to criminal medical and law enforcement actions? Because we allow it. And few in those professions (and I use that term lightly) will ever be held accountable in the almost wholly corrupt system that they endorse. When enough people realize that the only way to stop tyranny is to stand up to it then it will stop. You can't play their game, use their system, attempt to be fairly treated and expect to win. I truly believe that Brandon would still be in the same situation or worse if it wasn't for the legal foundation that agreed to fight for him. The judge made a miraculously clear decision. I was actually shocked by it. If he had not had that support I wonder if it would be different. America really is no longer truly free. The last glimmers of its existence are being snuffed out by willing traitors. Stand up for your rights if you want true Liberty for yourselves or your families. There are many out here that will support you. 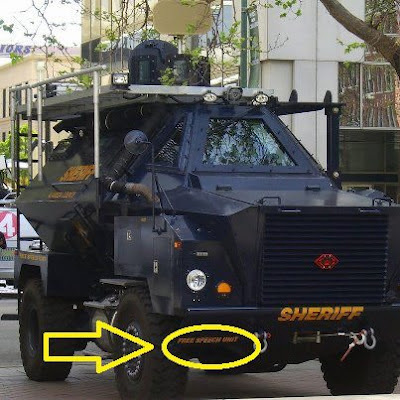 @liberanter... Well, it would appear, as far as I can find out, that this vehicle is in Alameda county California. With its sloped armor it looks like it's been purpose built to deflect incoming fire. Hmmmm. Doesn't take much to see where that's all headed does it! "Brandon Raub, a Marine combat veteran, was abducted at his home in Chesterfield, Virginia by a thugscrum of federal officials and local police on August 16." Well, well. Perhaps there is justice in this world, after all.